The best chriopractic care techniques can heal disc herniations and provide non-surgical treatment options. The term "Disc Injuries" covers a wide variety of conditions. The process of injuring a disc usually begins with dehydration of the disc material or with a harsh, forceful injury that tears the healthy tissue. The latter is a more rare occurrence since healthy disc tissue is much more tolerant of forces. 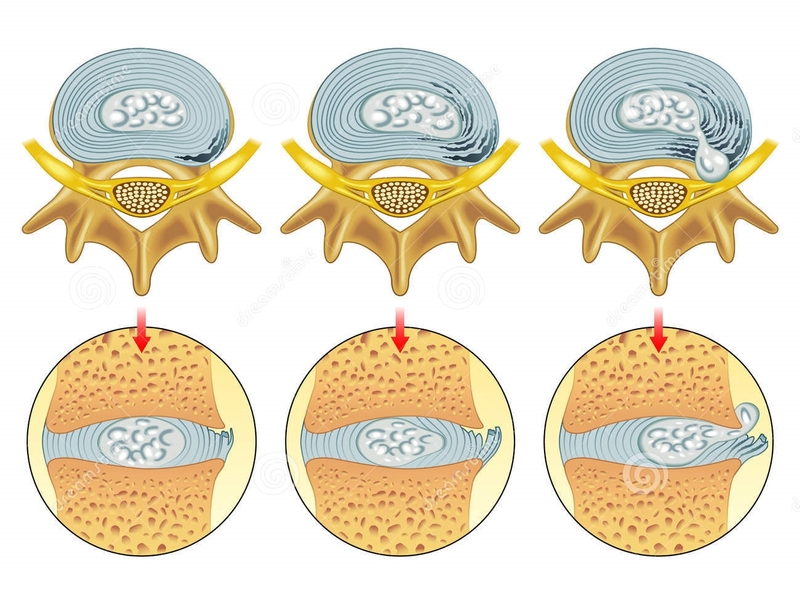 The image above shows the stages of disc injuries. Annular Tears can occur with normal daily movements and activities, if the disc is dehydrated. Normally your disc material is soft and pliable-like Jell-O. If the disc material dehydrates, it becomes hard and fibrous, like beef jerky or a sun dried tomato. This hard and fibrous material is not very pliable and instead of the disc material stretching with your normal spine movements, it tears. This is how annular tears occur. The images of the bird's eye view of the disc are showing the gooey center-the nucleus pulposis-and the surrounding annular rings. This is much like the design you see in a cut tree trunk. The annular rings are more fibrous and keep the Jell-O like material contained. When the annular rings tear, the next stage of disc injury occurs-Disc Bulge/Herniation. MRI is needed to visualize a disc. X-ray allows one to see the bone and the space the disc has to occupy, but not the disc itself. MRI also reveals much about the muscles surrounding the spine-the multifidus muscle group, which is your first line of defense in maintaining proper spinal motions (and not allowing too much motion which can injury discs). See below (Chiropractic Therapies such as the Wobble Chair) for images. Disc Bulges/Herniatons have different stages/types. Some can cause symptoms such as pain, tingling, numbness, weakness, and organ dysfunction, but many times there are no NOTICED symptoms at all. Some bulges/herniations can heal with conservative measures, like chiropractic care or physical therapy. Some may require more invasive care, like steroid injections or surgery. Prevention is best, but if an injury occurs, the goal is to keep it from progressing and allow it to heal. Disc Herniations occur when the final intact annular rings tear and the disc material protrudes into the spinal canal, or the foraminal space where the spinal nerves exit the spinal column. The Protruded Disc has the final few annular rings intact, but is protruding into the spinal canal or intervertebral foramen (IVF). The Extruded Disc occurs when the final annular rings tear, and the nucleus pulposis has spewed into the spinal canal or IVF but the material is still in contact with itself. The Sequested Disc occurs when the final annular rings tear and the nucleus pulposis separates from itself and acts as a free floating fragment in the spinal canal or IVF. This is usually a surgical situation. Symptoms of a disc injury may include pain, tingling, numbness, weakness, and organ dysfunction at the level of the injury. 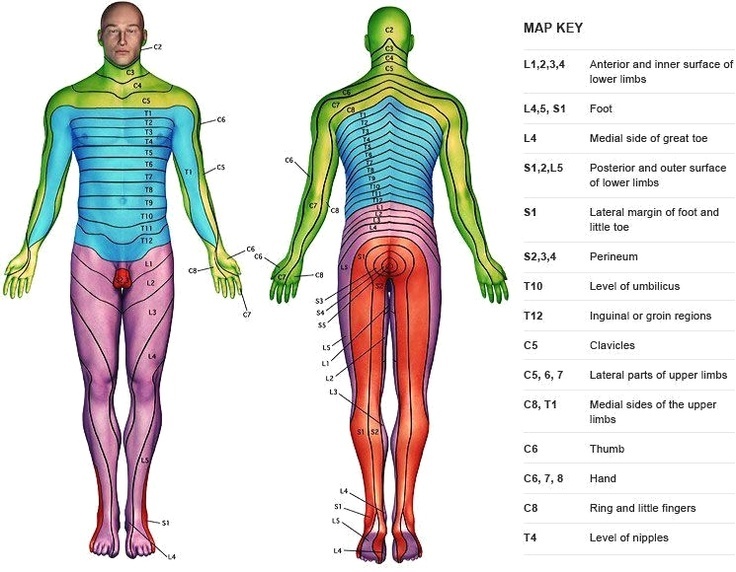 A dermatome and sclerotome chart can be helpful to identify the nerve or nerves involved. Specific Chiropractic Adjustments to the pelvis, sacral and/or lumbar regions realign the spinal column and joints, and allow your normal spinal mechanics to be restored, which can accelerate the healing process by increasing motion and blood flow to the injured disc region. Chiropractic Therapies such as the Wobble Chair –The exercises performed while using this device help to pump synovial fluid in and out of the spinal discs and joints. 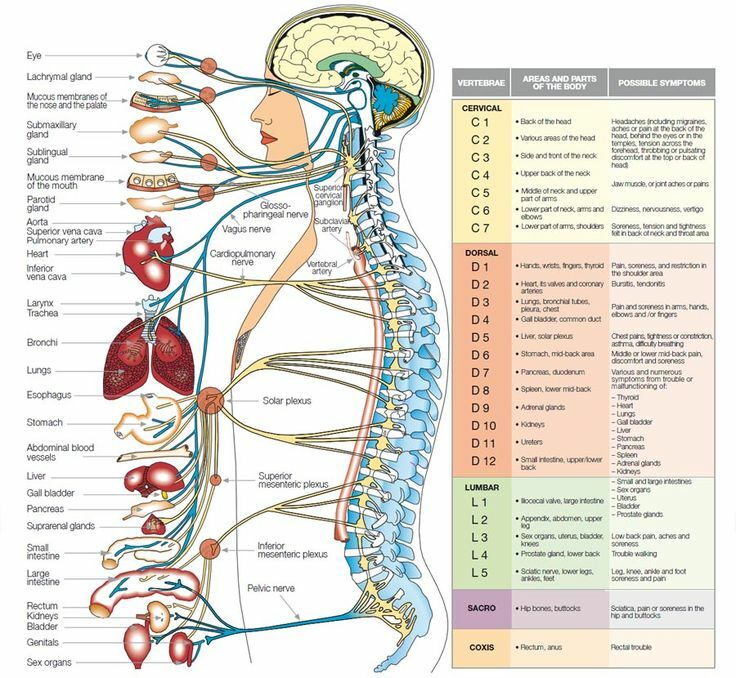 Additionally, the proprioceptive action of the repetitive movements trains the spinal stabilizing muscles-particularly the erector spinae and multifidi muscles of the spine. This images shows the location of the multifidus muscle group (right image) and fatty infiltration of the multifidus (left image) after recovery from an injury to the low back WITHOUT rehab. Fatty infiltration means more fat fibers and less muscle fibers. This equates to WEAKNESS in the multifidus, and less muscle to limit excessive motion at the joint and disc level. This weakness contributes to future injuries to the discs and ligaments. When performed prior the chiropractic adjustment, these exercises decrease the mechanical resistance in the muscles and joints, thus allowing your chiropractor to align your joints with less force. When your muscles are relaxed and not resisting change, your body can absorb more change in a shorter period of time (SO YOU HEAL AS FAST AS YOU POSSIBLY CAN). Cox Flexion Distraction-This is a specific chiropractic technique that is very helpful for treating low back pain related to disc or ligament injuries. Low back pain with radiculopathy is also successfully treated with Cox Flexion Distraction.